We don't know how much money Pokémon Shuffle is earning for Nintendo, but it's certainly tempting a decent number of 3DS owners to try it out for free. The tile-matching game has now reached 4 million downloads, which certainly isn't a number to be sniffed at. The game is celebrating through new events - on the one hand it's giving all players a Complexity -1 item, which is nice. 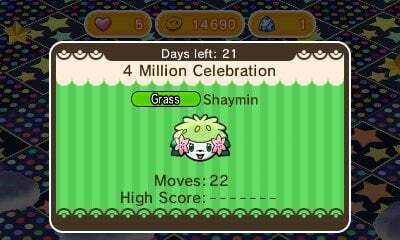 In addition there's a new event that'll run until 15th June; your goal is to capture a Shaymin, and clearing the stage will earn you 1000 coins first time around. Four million downloads is impressive, especially if a decent portion of those players buy some gems; whether we like it or not Nintendo's getting a taste for the free-to-play market. And a Complexity - 1 given away free aswell. All's good. I really like the game, but I'm not spending money on gems out of principle. If they were to release a physical copy in the Puzzle & Dragons Z style where the F2P parts get cut and replaced with and actual progress system, along with more content, I would pick it up in a heartbeat though. Why you won't just port this to phones as your first phone game Nintendo.....can't you imagine the many more numbers and possible transactions you'd get from a wider audience then your 3DS audience? how many of those 4 million are still playing I wonder, I know I'm not. I've been stuck on Steelix for about 5 days now so along with the daily pokemon and meowth at the weekend, this is a nice change. I wonder how long it'll be until we see advertisements throughout these free to play games. I got a Mega Lucario stone today -super happy- Even my BF plays Pokémon Shuffle every day. I don't spend money on it though, neither does my BF. But Nintendo might still benefit from Pokémon Shuffle. It makes 3DS owners pick up their 3DS more often, which is a good thing. I spend money on other games and I've even bought quite a few background themes. I am still playing the game even though I have caught over 200 Pokemon. I won't stop until I catch Genesect! Never understood the hate on this game, it's super addictive and fun! And I'm not even a pokemon fan. Almost 100hrs on it and not a single cent spent. It's unreal how successful this game has been. Wow, I actually won the mega stone this time. Now if they’d only give us another shot at the other megas…and Pinsar. The Complexity -1 finally allowed my son to gwt that pesky Mega MewTwo Y!! Feel your pain. Getting Pinsar was a use-all-the powerups proposition, which didn't sat well with me. Sorry, I'm not an uber-Pokemon fan, so I guess it could be named Pinsar (I have 3 systems, 2 in Spanish and one in English), and since I didn't catch it on any of them, I can't tell the real name. Sorry, I meant to type “the one that looks like a giant stag beetle”. I liked this game, but I deleted it when I reached the last stage. I didn't see any point in continuing further as there's no replay value unlike other puzzle games.